Roberta: Who is this, Enid? Enid: It's supposed to be Don Knotts. Roberta: And what was your reason for choosing him as your subject? Enid: I don't know -- I just like Don Knotts. Dialogue from Ghost World, screenplay by Daniel Clowes and Terry Zwigoff (2001). I just like Don Knotts too. "That's the sound of one tart popping." 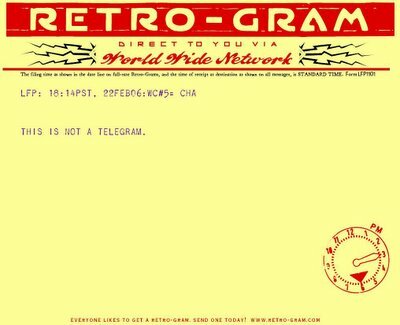 The Retro-Gram is a faux telegram, delivered as a .pdf via e-mail at no cost, or on paper via first-class mail "for a mere US$3.95." How postmodern can one get? September 2016: Both sites are gone. One student skipped class and then sent the professor an e-mail message asking for copies of her teaching notes. Another did not like her grade, and wrote a petulant message to the professor. Another explained that she was late for a Monday class because she was recovering from drinking too much at a wild weekend party. Jennifer Schultens, an associate professor of mathematics at the University of California, Davis, received this e-mail message last September from a student in her calculus course: "Should I buy a binder or a subject notebook? Since I'm a freshman, I'm not sure how to shop for school supplies. Would you let me know your recommendations? Thank you!" At colleges and universities nationwide, e-mail has made professors much more approachable. But many say it has made them too accessible, erasing boundaries that traditionally kept students at a healthy distance. These days, they say, students seem to view them as available around the clock, sending a steady stream of e-mail messages -- from 10 a week to 10 after every class -- that are too informal or downright inappropriate. You can read my guidelines for e-mailing a professor by clicking on the link below. This post is, as the sidebar jokes, my #1 hit, with thousands of visits. "Since his college graduation, my son seems to be suffering from abulia -- —he just can't decide what he wants to do next," sighed Philip. "I must have a prodigious quantity of mind," Mark Twain once wrote. "It takes me as much as a week, sometimes, to make it up." The indecision Twain laments is fairly common; only when inability to make decisions reaches an abnormal level does it have an uncommon name: "abulia." The English term we use today comes from a New Latin word that combines the prefix "a-," meaning "without," with the Greek word "boulē," meaning "will." "Abulia" can refer to the kind of generalized indecision that makes it impossible to choose what flavor ice cream you want, though it was created to name a severe medical disorder that can render a person nearly inert. My wife Elaine jokingly pointed out a line of Bald Guyz products in the drugstore this afternoon. After careful examination, I had to buy a box of Head Wipes. For $4.99, who could ask for a better typo? Our cashier didn't get it. If I'd had a Merriam-Webster's Collegiate Dictionary with me, I would've said "mange: any of various persistent contagious skin diseases marked esp. by eczematous inflammation and loss of hair, affecting domestic animals or sometimes humans, and caused by a minute parasitic mite." The other Bald Guyz products -- sunscreen, shampoo -- had awkward-looking blue stickers over the offending text, asking consumers to let the company know what they need. But the Head Wipes had somehow, err, slipped through. Update (June 7, 2007): An unexpected discovery about Bald Guyz Head Wipes! The poet Barbara Guest died on Wednesday in Berkeley, California. If not grain by grain, at least loaf by loaf. If not the river flow, at least its turn and tributary. If you're a returning visitor to Orange Crate Art, you'll notice that I've given my blog yet another makeover. The dotted lines and little arrows of the Rounders template no longer pleased me, so I spent a fair amount of time this afternoon deconstructing the template, risking disaster at every moment (because I have very little idea what I'm doing!). I like the clean lines, white columns, and dark background very much, and the signboard at the top gives Orange Crate Art more of that same great orange taste. Reader, I hope that you like it too. In my mailbox this evening, there was a plea for URGENT ATTENTION from one Gregorio Singleton. A name like that and he needs attention? His name bears a curious similarity to that of Faustino Pendleton, who showed up in my mailbox two days ago. Thinking about the folks who live in the mail reminded me of a wonderful post by Sean Payne on his blog Sign Language. Therein Sean analyzes the gnomic utterances of "poet" Jasper Gamble, whose work arrives in unbidden e-mails sent under a variety of aliases -- "Summer Pitts, Thomas Colon, Wean Diesel, and even Rosetta Beard." You can read Sean's witty commentary on Jasper and company via the link. Update: I've given Faustino Pendleton and Gregorio Singleton imaginary lives as designers whose product lines are featured on the Home Shopping Network -- "Faustino for Her" and "The Singleton Collection," respectively. I'm not sure though what products these lines feature. "Is he involved with anyone -- besides himself?" I am excited to tell you that we have selected your English department as one that will receive the special attention of a [publisher's name] English discipline specialist this spring. I've been saving word-processed words as .rtf files (rich text format) for years. They're small, safe (no virus-carrying macros), and can be opened and edited with virtually any word-processor. In an idle moment yesterday, I thought it might be smart to convert all my old .doc (Microsoft Word) files to .rtf. I had no idea how difficult this seemingly simple task would turn out to be. I knew that I couldn't do this work by hand. So I downloaded a free renaming program to change the file extension of my .doc files. As it turns out though, changing the extension of a .doc file doesn't change the file's identity. As I found when re-checking the size of my documents folder and comparing a few "changed" files and their backed-up .doc versions, there had been no change in size. That was the first sign that this project was going to be more complicated than I thought. And things were now rather confused, because the files that were now labeled as .rtf files in my folders were still identified as .doc files in Microsoft Word's Open and Save dialog boxes. I started to get the sinking feeling that I get whenever things have gone really wrong on a computer. All was not lost though. (If it had been, I'd be doing something other than writing a blog entry.) I changed the extensions back to .doc and did some online reading (there seems to be very little about this topic). What I really needed, it appeared, was the Batch Conversion Wizard in Microsoft Word. I've been using Word for years, but I'd never seen this tool. It's found by going to File, New, Templates, On my computer, and Other documents. I think of a template as a tool with which to design a new document, so a tool to change what's already been created seems oddly placed among the templates. The directions for the Wizard's use in Word's Help file are clearly not for someone working with a large number of files: "Place the documents you want to convert in a single folder." Ha. As one would expect, there is no acknowledgement in the Help file that rich text format makes it easy to share one's work with people who don't use Microsoft Word. The only reference to other programs is to Microsoft Works. The Help file's advice to work with a single folder deftly avoids acknowledging what immediately becomes obvious: the Wizard cannot see files in subfolders. Some Wizard. So I changed my .doc files by going through each folder and sub-folder and sub-sub folder in my documents folder, selecting "all," and letting the converter do its thing. Some .docs wouldn't convert automatically; I converted those by opening them and resaving them as .rtf files. And while doing so, I noticed something curious -- when one "saves as" with a .doc file, "rich text format" is not visible in the drop-down selection box (even if it is Word's default for saving). "Rich text format" shows up only after scrolling. The ordering of "save as" options here seems haphazard. Is "document template" really a more likely choice than rich text format for saving a file? Clicking ".dot" is certainly a tedious mistake to undo -- one has to dig down to the Templates folder in Application Data to get to the accidental file. So why is "document template" more accessible than .rtf? And why is .rtf not visible among the first few choices? Is Microsoft's intent to make it just a bit more tedious to save files in formats other than its proprietary ones? Consider finally the look of the Wizard at the top of this post. That's from Office 2003. What can one make of a corporation that allows such shabby inconsistency in its user interface? Right now, that jittery, garish, circa-1997-turquoise-and-teal Wizard embodies for me all that's ill-planned and shoddy in Microsoft's software. A small but crucial part of my poetry base, forgotten for a long time. I was fascinated as a little kid by the idea of fingers having polite conversations but then running away. And I sang this song with my children when they were younger. Why did this song return? Perhaps because I'm looking forward to trying out the Thumbthing, a nifty tool for reading. I am all thumbs. Update: I tried the Thumbthing. It is a nifty tool, but I'm going to stick with my thumbs. "And then, when I tried to print my essay, it disappeared!" 1. Plan ahead. If you're working in a computer lab, make sure that you set aside enough time for computer use. If you're using a computer and a printer of your own, have a spare printer cartridge and plenty of paper available. 2. If you do all your writing at the computer, print out a draft at frequent intervals. You can conserve paper and ink by choosing "fast" or "everyday" mode and by printing two pages per sheet of paper. 3. Save your work frequently, to a hard drive and a USB flash drive. It's still possible to run into problems when using Auto Recover, so hit Control-S (on a Mac, Command-S) every few minutes to save your work to your hard drive. Then copy the file to your USB gadget. An additional tip: save your word-processed work in rich text format, so that it's available to virtually any word-processing program. 4. Save your work online, by sending your draft to your e-mail address as an attachment. It's also smart to make a secure space online where you can store all your academic work for easy access. Michael Arrington's survey can get you started. And now, even in a worst-case scenario — your computer stolen, your USB gadget lost, your drafts eaten by a dog! — you can still get to your work. My hunch is that in another five or ten years, cell-free areas will be as familiar as smoke-free areas are today. In a crackdown reminiscent of the campaign against nicotine addicts, a widening array of states and businesses are restricting cellphone use. There are limits not just on planes, trains and automobiles but also in restaurants, gyms, golf courses, churches, banks and post offices. Some restaurants are creating cellphone areas, akin to smoking sections, where people can talk without bothering other diners. [T]his semester, 8 of my 20 sophomore English composition students scored significantly better on in-class essays written by hand in a timed situation. Some jumped more than a full grade level. In my three freshman composition classes, almost 20 of 60 students excelled when allowed to write in class rather than compose typed papers on their own time. In fact, at a large community college in California where I taught for six years, I frequently saw 10 to 25 percent of my developmental- and freshman-level writers do significantly better when asked to compose in-class with a topic given just before a two-hour writing period. Over many semesters, I've seen the same sorts of results. Wilson and I would differ on the explanation: she thinks that students are revising their outside writing until it becomes "stiff and mechanical." I don't suspect excessive revision: my hunch is that when students are writing in class, they're writing without distractions, without continuous partial attention, and are thus able to make more coherent essays. Writing in class, they're doing something quite different from "playing the keyboard" to get to Control-P.
[H]andwriting encourages students to focus on the writing process; for those less experienced with computers, keyboarding encourages students to focus on the end product. When asked to type up a sample paragraph in a classroom computer lab, all 20 of my English composition students spent more than 15-minutes setting up a document in MS Word, setting margins, choosing a font, centering a title, and typing up their names, instructor's name and class name at the top so that it sat flush-right. This left a disappointing 30-minutes of actual composing of text -- and of that, approximately five to nine more minutes were wasted when students insisted on particular line breaks with text, tried to change the amount of space between lines, and attempted to remove forced underlining of URLs. Each of these issues becomes a non-issue with handwritten work. My own preference, in any context, is to keep the focus on the work of writing, and to make the means of production as simple as possible. Writing is not word-processing. But if a computer makes its easier, not more difficult, to focus on the work of writing, that's good too. Related posts: "Amish computing", "My version of 'Amish computing'"
A few days ago I found myself fascinated by the names attached to the junk that pushes its way into my "mailbox" (that's a metaphor; I'm speaking of e-mail). 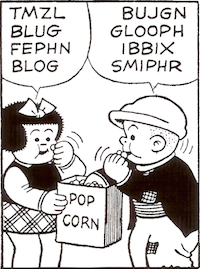 My guess is that these names are randomly generated from lists of firsts and lasts (and, sometimes, middle initials). Some recall the zanier moments of, say, Bob and Ray. Some are a matter of dazzling exotica. Some are just strangely evocative. I took a small sample from one morning's spam and invented a few brief lives. A disclaimer: The characters described below are the work of my imagination. They bear no relation to any real person, living or dead. Entertainer, worked for many years at "The Stable," in downtown Terre Haute. Director of activities at The Senior Center. "Your Choice for Weather," weeknights at 6 and 10. Manager of local big-box store, currently reading Don't Sweat the Small Stuff. Shop teacher at Emmanuel Trades High School. Former welterweight; more recently, Coley Georgette's manager; present whereabouts unknown. Update, 14 February 2005: In the mail this evening -- Faustino Pendleton! I have no further information at this time. A television review on Jan. 2 about "Rollergirls," a documentary-style reality series on A&E, misidentified the player who explained another player's absence by saying, "She had some family issues to deal with, and she also messed up her foot at the Jell-O wrestling." It was Cha Cha, not Lux. The Times has not yet corrected its November 2005 goof about the Quarrymen's recording of "That'll Be the Day" (see below for details). Dowdy. World. Mourns. End. Of. Era. Stop. After 145 years, Western Union has quietly stopped sending telegrams. "Effective January 27, 2006, Western Union will discontinue all Telegram and Commercial Messaging services. We regret any inconvenience this may cause you, and we thank you for your loyal patronage. If you have any questions or concerns, please contact a customer service representative." The decline of telegram use goes back at least to the 1980s, when long-distance telephone service became cheap enough to offer a viable alternative in many if not most cases. Faxes didn't help. Email could be counted as the final nail in the coffin. 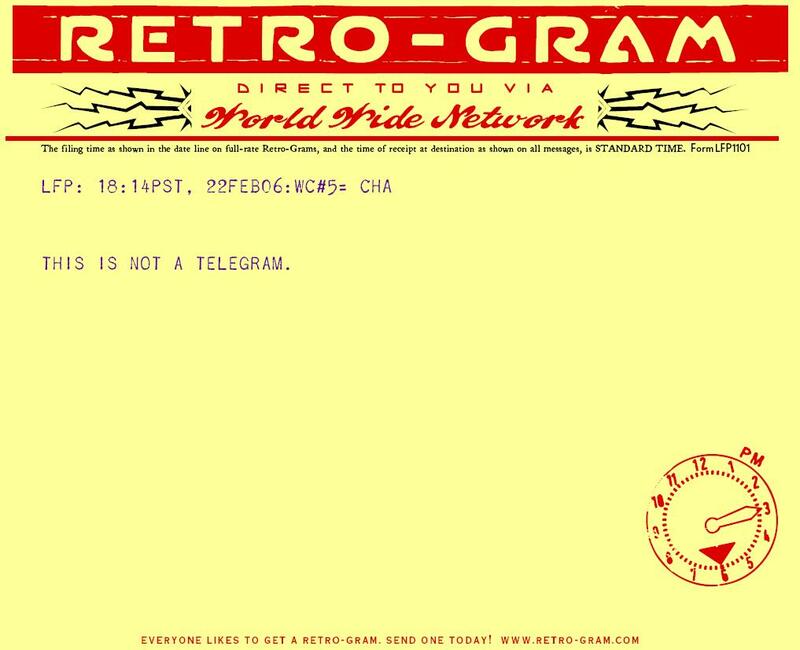 "Era Ends: Western Union Stops Sending Telegrams"
I must admit that my use of telegrams was, well, non-existent. Still, it was nice to know that they were around.